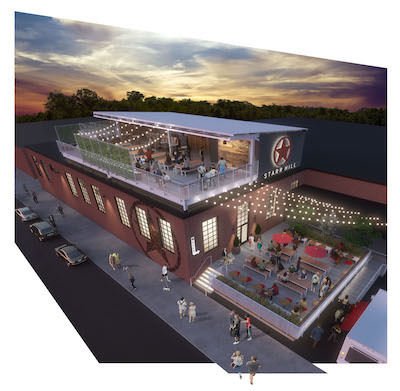 Starr Hill Brewery announced Wednesday it plans to open a beer hall and rooftop bar in Richmond. The Crozet-based brewery says the Starr Hill Beer Hall & Rooftop will open at 3406 W. Leigh St. in Scott’s Addition this summer. The first floor will include more than 4,500 square feet for the brewery and tap room with an additional 1,000 square feet for a deck outside. It also will feature a 3,000-square-foot rooftop bar and beer garden. The brewery will offer more than 20 styles of beer. It will serve as the brewery’s first location dedicated to producing wild ales. John Pritzlaff and Jenny Stoner of Cushman & Wakefield | Thalhimer handled the lease negotiations on behalf of Starr Hill Brewery, and Amy Broderick and Mac Wilson represented the landlord, Thalhimer Realty Partners Inc.
Starr Hill is Virginia’s largest homegrown brewery. In addition to its brewery and tap room in Crozet, Starr Hill has a pilot brewery in Roanoke that opened in fall 2017. Virginia Business spoke with the company last year for a story about Virginia’s beer industry.